InfantBows: New Deluxe Gift Set now available! Don't miss out! Enter your email address to have updates sent to your inbox. New Deluxe Gift Set now available! © InfantBows. Powered by Blogger. We are so excited to announce our latest and greatest InfantBows™ Deluxe Gift Set. Now available on Amazon.com. 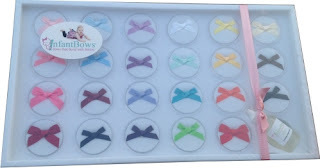 Gift set includes 23 bows, InfanBow Glue™, a keepsake box with individual bow containers that are easy to take on the go. As always, InfantBows™ have a unique backing for the all natural InfantBow Glue™. This backing helps provide a suction type of stick and keeps the bow looking new, so it can be used over and over. 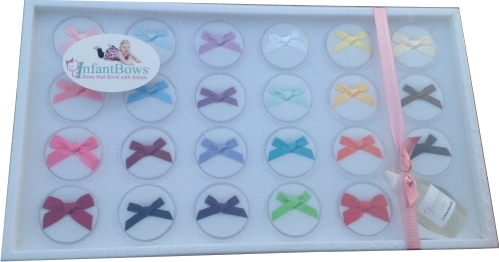 This InfantBows™ Gift Set is sure to be the hit of any baby shower! Thanks to everyone for your continued support!